I spent two days at the RHS Autumn Garden Show in London this past week and what a lovely, friendly, bumper show it was! Entry is by ticket, even for RHS members now, and proceeds are put towards funding garden apprenticeships at the RHS gardens, so who could complain at that? As I've been many times before I almost didn't go, but looking at the online programme a few days before, it seemed interesting enough to draw me away from my garden tasks on a clear blue-sky day. At that stage, there was a talk or two that I was interested in and I thought I'd also pick up some onions and garlic for planting now in the veg patch. By the end of the first day, there was so much that I still wanted to see, do and hear that I knew I'd go back, complete with a timetable to try and fit everything in! 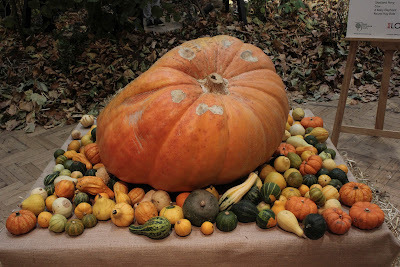 Third biggest pumpkin, same weight as a baby elephant! The RHS have balanced out the entry charge by boosting the content of the show; there were talks, free workshops, library tours, foraging walks, flower arranging, and nature installations in addition to the usual retail fare of plants, bulbs, seeds, and associated garden ephemera. Hungry tummies were satisfied with delicious fare available throughout the day from food sellers. My brie and red berries toasted sandwich from Elephant Kitchen will live on in my memory as possibly the most delicious snack ever! The cakes (gluten free) looked good too but I regretfully resisted. 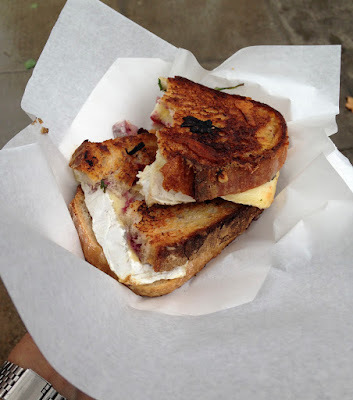 The most delicious cheese toastie in the world. Official. 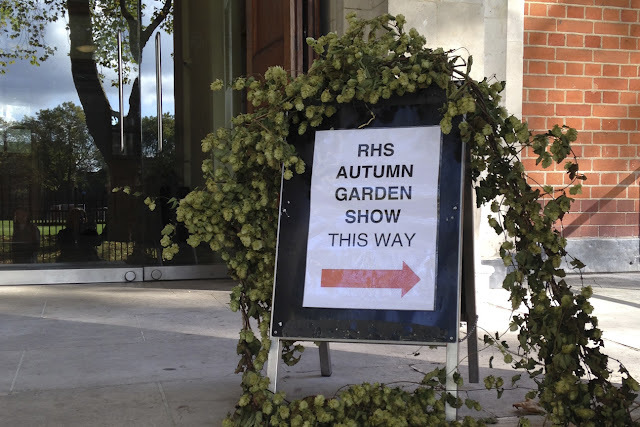 The RHS use both their halls for this show but a crowd-pulling programme of hour-long talks throughout both days kept me in the smaller Lindley Hall for most of my time. Roy Lancaster spoke of his lifetime's work with plants, Anne Swithinbank talked of foraging in our gardens, Mark Diacono brought us inspiration for growing unusual tastes and Bill Oddie held forth on wildlife. With such an array of well known speakers, I quickly learned to get there early for a seat! For me, there were two stand out talks - Nick Bailey (tv presenter, author, designer) talked about the why's and wherefore's of growing unusual edibles in a city environment and Emily Rae (owner of Sussex based Plants4Presents) gave us the inside scoop on how to successfully grow spices such as ginger, turmeric, lemongrass and more. Look out for my follow up posts on Nick, Emily and Anne's talks! 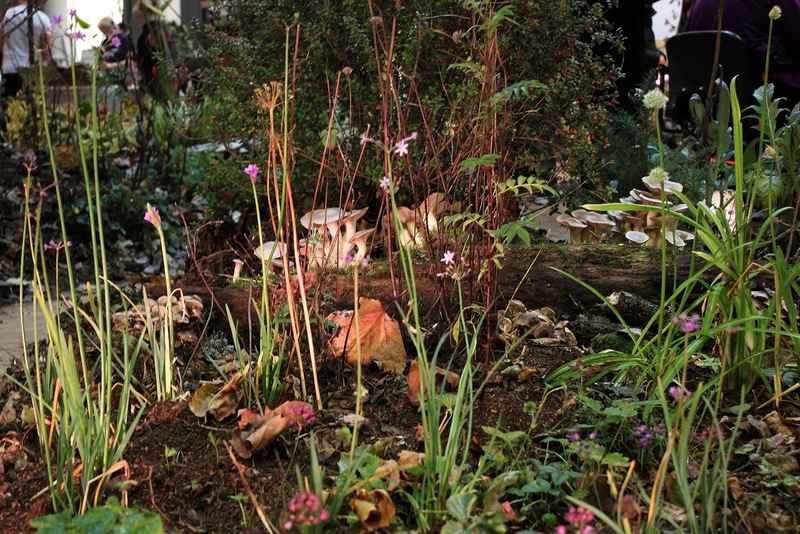 In the middle of the room, an autumn forager's forest had been created by Jon Davies. Jon is incredibly passionate about gardening and food growing in a sustainable way (forest gardening) and has won awards for his garden designs. I signed up for one of his mini tours of the forest and had all sorts of edible plants and shrubs pointed out to me. Every plant in the forest had edible or medicinal uses although, as passionate as Jon is about foraging, he admitted that some flavours, such as pine needles, take a bit of adjusting to! Forager's forest ... or fairy kingdom? In the forest extraordinary stacks of mushrooms grew on logs surrounded by ferns, hops and kiwis clambered up through the tree canopy, a small pond hid behind birch logs, and herbs, strawberries and alliums grew on the forest floor - the whole thing was beautifully lit, stunning and magical. I loved it (can you tell?) and was surprised to see how many of the ornamental plants growing in my gardens are edible in some way. Liriope roots, Ajuga and Alchemilla shoots, wild strawberries, hips, haws and sloes are a few of the foodstuffs people would have survived on in pre-civilisation - plus a lot of plants that we now regard as weeds (dandelion, plantain, clover). I'm fascinated by all this and while I'm not about to turn my back on lettuces, squashes and the like, I love the potential for incorporating edibles into a perennial garden. Continuing with the foraging theme, I found myself chatting to Croydon based enterprise Wild in the City. They offer outdoor experiences to reconnect city dwellers with nature, something which has been proven to offer so many health benefits. I know how much better I feel after being outdoors so I applaud this initiative. Some of their courses are free (woodland walks, bushcraft, foraging) and some fund their work, such as basket making, spoon carving and charcoal making. I'm going to be looking out for those for next year. I hope this is the start of an idea that will spread - it could be a life changer for future generations. I also had an interesting chat with Indie Farmer, Nigel Akehurst. He told me that he left the city a few years ago, returning to Sussex to help on his parents' farm and has no regrets. These days he both helps on the family farm and has set up The Indie Farmer online magazine and newsletter, an intelligent read about small scale farming and food culture. I looked it up when I got home and found it a very informative and thought provoking read. I like to know what's happening in the David and Goliath world of commercial food retailing and wouldn't have known of this resource if Nigel hadn't brought his enthusiasm and vision to share with visitors at the show. Flower ball arrangements, herb seed sowing and learning to forage were on offer but I regretfully gave them a miss in favour of 'how to grow an avocado tree' and 'printmaking with leaves and flowers'. After packing in so much during the day, I felt the need for something soothing and creative. The avocado workshop promised 'guaranteed germination' so naturally I was interested - especially as the 80's trend of having an avocado growing indoors is back in fashion. (I'm not trendy but I confess I haven't succeeded with indoor plants since those halcyon eighties days.) I have to wait to see if the method works, (post to follow if so!) but suffice to say that as the last participant on the last day, I came home with two potted up avocado pits plus a bag of leftover avocados to eat. And the printmaking workshop? This, I loved. I'd been intrigued by the sound of hammering during the previous day and wandered past to see what was going on. 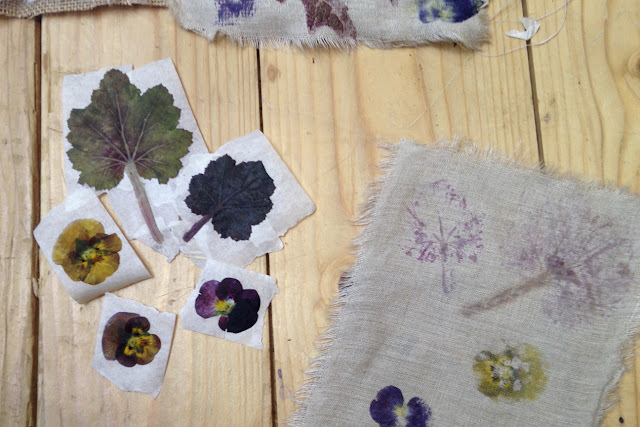 What I discovered was a way to imprint fabric (or paper) with the delicate colours of the garden. We used heuchera leaves and viola flowers to create tiny works of plant art and I'm inspired to take this forward with plants from my own garden. Our tutor, Judith Baehner, is a advocate for green living, stylist, author, lecturer and awesome maker of terrariums. At the moment her books are written in Dutch, her native language, but I'm hoping a publisher will be found soon for her latest work 'The Plant Lab', named after her blog. I had time to talk to her about her work and discovered a wonderful and gentle kindred spirit with a passion for plants and living a greener life. One tiny gripe, I found the marketplace exhibitors a bit sprawled and confusing. Looking back through the programme this morning, I'm frustrated to see how much I missed, even though I went on both days! 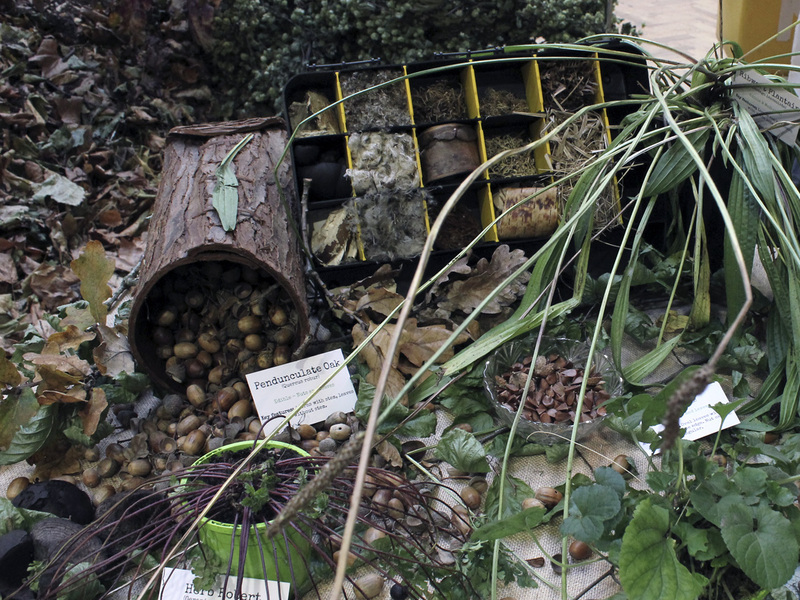 I would have liked to see The Salutation garden's display of flower skeletons and seedheads; Wardian cases and terrariums; sanguisorbas from the Botanical Nursery; eco prints and natural textiles from Flextiles ... the list goes on. Although I seem to have missed quite a bit, I hunted down the houseplants from Forest London - and walked away with a tiny Pilea to care for. That was a good compromise because there was so much more to see, do and learn and, being me, I wanted it all. So, did I get my onions and garlic? Yes! I was Pennard's last customer of the day; I love talking to those guys, they're so knowledgeable - and, very kindly, I was given an extra bumper bag of white onion sets to bring home. Find out more about edible or medicinal plants from the PFAF (Plants for a future) database here. Last month I went to the fabulous GLEE exhibition in Birmingham's NEC centre and saw so many beautiful, useful and desirable products that made the (very) early start to the day worthwhile. 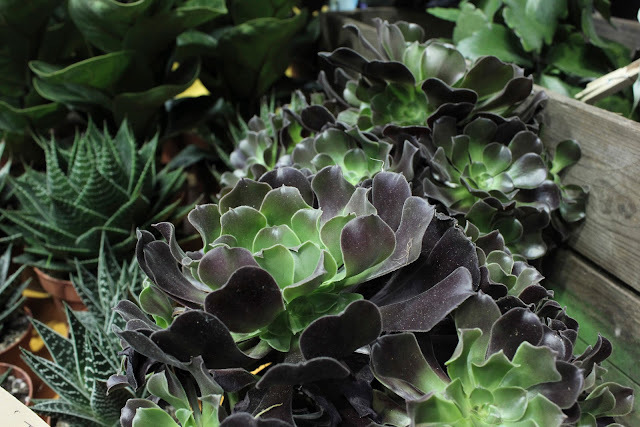 The exhibition is an annual trade show held over three days so that new and existing garden related products can be showcased to buyers for the retail market. Journalists and, more recently, bloggers are also welcome but it's not open to the public. Looking at the map on the GLEE website, I guessed there would be a lot to see but the reality exceeded all expectations! I did my homework the day before and noted the exhibitors I wanted to talk to but even with a game plan, map, and very quick scurrying around, I suspect that I missed seeing a lot of what was on show as there was so much to be pleasantly diverted by. Ooh, I love a tidy edge. 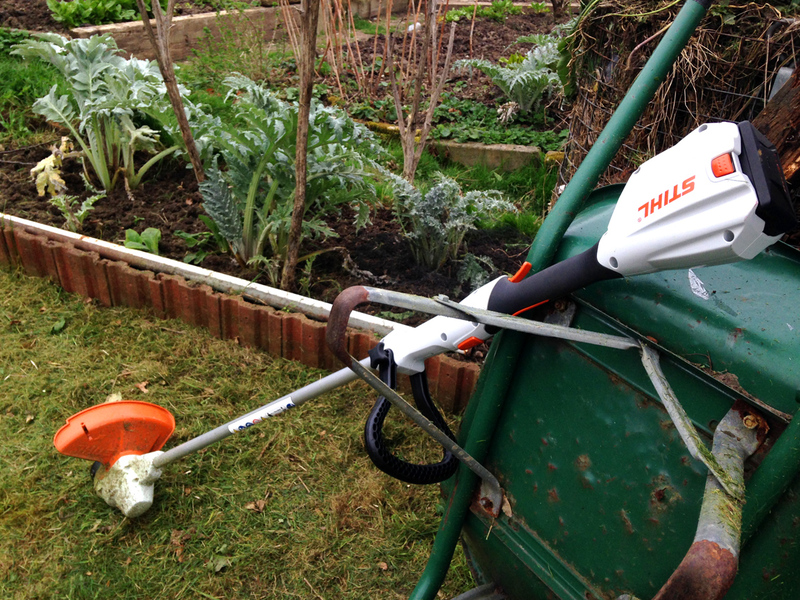 While I enjoy a good 'green gym' workout in the garden, there are all too frequent times when the more energetic tasks on the To Do List are a stretch too far at the wrong end of a tiring day. Thus the shears are put away in favour of a cup of tea and a sit down while the hedge surrounding the middle garden is allowed to slowly thicken once again and the allotment grass is left "for another day". So it was with great anticipation (not to mention joy, relief and some trepidation) that I gladly accepted Stihl's opportunity to review a few products in their compact cordless range. 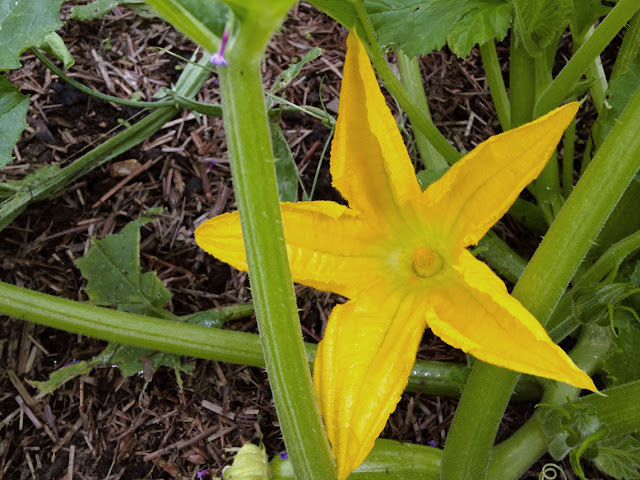 Strulch: Another weapon against slugs? Since last May I've been trialling a product called Strulch. (Just to satisfy my own curiosity, nothing sponsored.) Have you heard of it? Maybe, maybe not. I hadn't until another allotment holder recommended it as a summer mulch. I wrote the name down and then looked it up when I got home.